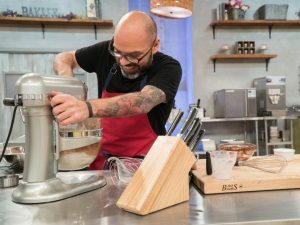 Diva Foodies is excited to welcome Food Network Spring Baking Championship finalist Fausto Barragan to #FoodTVChat tonight, March 30th at 7PM Eastern/4PM Pacific. Please join us! 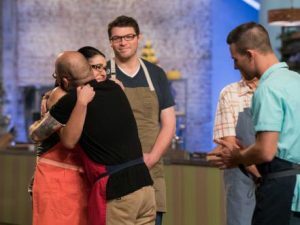 As you know, Food Network Spring Baking Championship is in its third season and this season true to form has had its share of heart crushing challenges. This season, one of those challenges came to #FoodTVChat guest host Fausto Barragan on March 27th in the form of puff pastry, specifically a Napoleon. 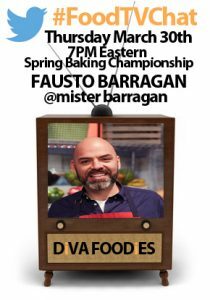 Be sure and join us tonight on #FoodTVChat for the opportunity to chat with Fausto and hear more about his life and experiences on #SpringBakingChampionship. To help you get your questions ready, below is a little more about him. His story is fascinating! Fausto Barragan is an elementary school special needs principal by day. He chose a career in education because of the teachers that helped shape his own life and opened the door to the opportunities that allowed him to get his own education. He believes that all children should have choices for their future that involve following their passions and that finding one’s passion comes from educational opportunities. And those educational opportunities are not always traditional. He says that if it wasn’t for music and baking he never would have made it through college. He credits his mother for introducing him to cooking and his teachers for recognizing and encouraging his musical talents. He is a classically trained vocalists and says he would have dropped out of high school if not for a teacher, Mrs. Turner, who helped him get a musical scholarship to go to college. He graduated from Azusa Pacific University with a major in music and liberal studies and became a special education teacher. At 28 years old he became a principal. Fausto got his start cooking at home by making scrambled eggs when he was 4 and hungry. He was inspired by his mother who is an exceptional cook and makes amazing tamales. She sells them at a local Farmer’s Market and also caters. 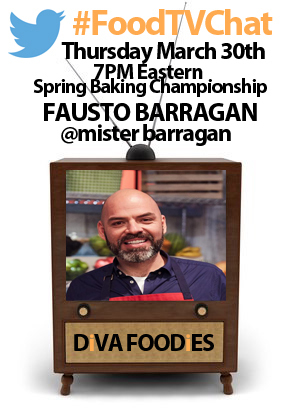 We will have to get some more specifics from Fausto during #FoodTVChat. Besides watching his mother cook he says he was intrigued by the chefs he saw on TV such as Julia Childs and Jeff Smith, the Frugal Gourmet. He worked in food service throughout college and polished his baking skills by cooking for his students who didn’t always have cakes for their birthdays. Fausto had never cooked competitively when he saw a promo for #SpringBaking Championship. He sent in an application and after submitting a video and several interviews he was chosen to be a contestant for season 3. He was the only contestant who didn’t bake as a full time profession.